I said that I would let you all know about the results of my investigation into the Rhodes photographs. When this began, I had hoped for positive results simply because it seemed that too often I was exposing hoaxes and false information. It would be nice to underscore the unknown nature of a sighting. Rhodes, it seemed, was a genius with multiple patents, who had a Ph.D. and who had photographed some kind of unknown object over Phoenix back in 1947. The Army, and later the Air Force, investigation seemed to be geared more to smearing him than it did to finding an unbiased answer to this case. That smear has little to do with the evidence that surround the pictures. Here’s where we are today. Rhodes told, at least, two versions of how he received his advanced degree without spending the time and energy earning it in a more traditional fashion. While I could accept one version, that is, he had been awarded some sort of equivalency based on testing and his work with the Navy, the other didn’t make any sense to me. That he gave two versions eliminates, at least in my mind, the validity of his degree. He had inflated his educational background more for his own ego than for any other reason. Because of this, his story is more than "beclouded" as Dr. James McDonald suggested. In my research, I talked to or communicated with a couple of people who knew Rhodes. It seems they held him in high regard, were impressed with his genius, and knew that he was a clever man. One of those, Dr. Aden Meinel, who had worked with him in the mid-1950s would not confirm the story that Rhodes told about his "90 day wonder" degree, and I find that telling. In the course of my work, I learned that what Rhodes had photographed, according to one source, was some sort of balloon-borne telescope and it was part of a then classified project that had been directed by SAFSP which is the Secretary of the Air Force Special Projects. Most of these were related to aerial reconnaissance and photography. In other words, they were attempting to determine how well objects on Earth could be photographed using a variety of platforms at a variety of altitudes. He was recalled to active duty to plan and photograph the atomic bomb tests at Bikini Atoll. What he saw changed the course of world history. It was obvious to Mr. Leghorn that there could not be another war using nuclear weapons. His vision; a new approach- deterrence and arms control- to prevent military conflict and to prevail if deterrence failed. So began his pursuit into aerospace reconnaissance, where he became one of the unsung heroes of the Cold War. Richard Leghorn has been described as a true visionary in conceiving, planning and implementation of activities in the field of airborne and space reconnaissance developments, including origination of the "Open Skies" concept subsequently in preparation for Eisenhower’s conference of the four powers (US, USSR, Britain and France) at Geneva on July 15 1955. As a consultant and then active participant to the USAF Scientific Advisory Board as special assistant to the President for Disarmament Affairs, he was principal contributor to the early CORONA camera development. He was Chief of Intelligence and Reconnaissance Systems Planning and Development at the Pentagon. In "the Secret Empire- Eisenhower, the CIA and the Hidden Story of America’s Space Espionage", Philip Taubman of the New York Times wrote "no one person can fairly be called the progenitor of the reconnaissance revolution, but Richard S. Leghorn comes as close as anyone to fitting the description. Without Leghorn’s incredible skills and dedication our space reconnaissance technology would never have developed." Mr. Leghorn was among six pioneers inducted to Air Force Space and Missile Pioneers Hall of Fame on August 24, 2006 for his development of early airborne and space-based photographic reconnaissance systems. So, it is possible that Rhodes photographed something that had been created to test cameras and photographic capabilities from high altitudes. The problem is that craft, as has been described to me, is about only about three feet in diameter. If it was balloon-borne, it should not have made noise, and would be drifting with the wind, not flying about at several hundred miles an hour. However, if it was only three feet in diameter, then Rhodes miscalculated the size, and if he had done that, then his estimates of speed and altitude would be way off as well. All his calculations were in error. And I would expect other photographs to be made of something strange that hung in the air for two days, unless it was small and at low altitude. We do have the suggestion that Lewis Larmore also photographed the object, but, unfortunately, that information came from Rhodes and as far as I can tell has not been corroborated. If Larmore did photograph something, I have been unable to find either those photographs or a follow up in the Air Force files. At this point, this is all the information that I have. I’m hoping that someone in Arizona or New York(where Leghorn lives) might be able to check the local libraries and newspapers to see if there are any follow up stories or examples of other photographs. A look at the city directories for Phoenix and William A. Rhodes might be interesting if not very useful. At this point, given what I now know, I have little faith that the Rhodes photographs will lead us anywhere useful. The reputation of the man who took them is tainted by his own "resume enhancements." We have not found anything to suggest the other pictures he mentioned ever surfaced and it seems that his interest in anything was fairly short term. In the end, I suppose we can ignore the photographs and the implications, unless and until someone finds something more. This was not the result that I had hoped for. I seem to have ignited a firestorm with my original piece about the Rhodes photographs. I was just passing along information that I had, thinking others would be interested in it. I guess I got that right. One of the stumbling blocks of the case was Rhodes’ claim of a doctoral degree. Given what I knew then, I figured it was something that was of only tangential importance. The explanation offered by Rhodes seemed reasonable to me, and if others thought it was an exaggeration, it wasn’t a very big one. I had heard that others, in the government, had been awarded jobs based on tests and equivalency. That Rhodes attached more importance to this than others might was just one of those things. But I have heard from a number of others who thought that Rhodes’ claim of a doctoral degree was more than an embellishment. To them it meant that Rhodes couldn’t be trusted and it was enough to reject the photographs he had taken. To them, Rhodes had faked the photographs as a way of increasing his importance. We have already seen the posting he made a number of years ago telling us how all this had come about. He had taken tests while in the Navy, had passed with a high enough score that he could work on projects at a doctoral level, and that this had somehow been translated into an official degree. I know of others who operate in a similar way. I was inclined to give him the benefit of the doubt, especially when he was able to produce, for Dr. James McDonald, a small, plastic covered replica of his degree from Columbia. I did a lot of checking on Rhodes [sic] degrees, because there seemed something odd about an honorary PhD based on the kind of work I could image him doing. Columbia said no record of any such degree. Geo. Washington [University] said no record of a BA ever given to Rhodes in the period I specified. So I made a trip up there... he showed me a photo-miniature in plastic of the alleged Columbia degree, and he said he had the original somewhere in his files but did not show it to me. I kept probing, already having the information that Columbia had no record of any degree. As I kept going over the thing he finally volunteered the remark that he, himself, had checked with Columbia about a year after [Lee] DeForrest presented him with the certificate, found no record and confronted DeForrest with the information, and was non-plussed by D F putting his arm over his shoulder and saying something to the effect, that, "Well, my boy that’s the way those things happen sometimes," and saying no more about it. Okay, this is little hard to take and McDonald said that "we have to view the case as somewhat beclouded." But that was 1967 and it is not what he had said to others earlier. According to an Air Force Inspector General report of August 17, 1949, Rhodes apparently told the investigator, as well as neighbors that, "[He] wrote scientific article for nationally known magazine [not identified by either Rhodes or the investigator] and received honorary Doctor of Science degree from [redacted but probably Columbia] University for this article." So, here is a different version of how he came to obtain a doctoral degree without leaving the necessary footprint. And while I would cut him some slack for the story told to McDonald, this different version is quite difficult to believe. It stretched credulity to the limit. Now we go to the Internet posting by Rhodes to explain his degree. The key sentences are these, "One day, my boss summoned me to his office and explained: ‘We have a total absence of degree'd doctorates, and having already passed requirements, you have been selected to receive a Ph.D in Physics.’ The degree would be known by the nickname ‘90 Day Wonder’, and my work would not be disrupted to gain it." Nothing was said about what university was granting these "90 Day Wonder" degrees and nothing about who his boss was. In addition, his work with the Navy terminated early in 1942, or not that long after the war started, so you have to wonder about the importance of that work. He suggested that it had ended, but I think a physicist working at the Ph.D. level would be someone to retain. He claimed a conversation with Dr. Aden Meinel, who corroborated that he too had such a degree, at least according to Rhodes. But the Internet tells me that Dr. Meinel, who might have had such a "90 day wonder" degree at one point, had a doctoral degree granted by the University of California – Berkeley in 1949. And, worst still, Dr. Meinel has not confirmed the conversation. In my correspondence with Dr. Meinel, I asked about this, specifically. Both times he did not answer the question, telling me, instead that Rhodes was a clever guy... a genius... who helped him, Meinel, with some of his work in the mid-1950s. Valuable help, it is clear but that he, Rhodes, lost interest once he had solved the problems. At this point I’m ready to suggest that Rhodes is no more trustworthy than those fellows who claim high military rank to improve their credibility. It seems to me that Rhodes had invented this tale of the mysterious degree to improve his credibility and to suggest to his neighbors he was more important than he was. And, like those people claiming high military rank, he had some documents to prove it but the university didn’t back him up. He offered no names, other than Dr. Meinel, probably because he believed Dr. Meinel was dead and couldn’t dispute him. As for the pictures, I have been told what he photographed, but I have been unable to verify this. I’m attempting to find pictures of the real object, which is a terrestrially–made craft of limited size, speed and capability. But even without that, and even with Rhodes making money off his inventions, his holding of various patents, and his somewhat erratic life style, I don’t think there is much of a case left here. If I can nail down the explanation, then we’re done. If I can’t, then there is still that small hole left that suggests there might be something of value in the case... but at this point, I doubt it. My plan had been to hold off on this until later, but with some suggesting there is still life in MJ-12, I thought I would attempt to drive a nail into this particular coffin. It is clear, based on some early research, that MJ-12 is a hoax created in the early 1980s, probably by Bill Moore and Richard Doty. Here’s what we all seem to know. The information contained in the Eisenhower Briefing Document (EBD) reflects the state of UFO crash research in the early 1980s. Bill Moore told a number of people, and you can find their names on the Internet, that he was thinking of creating a "Roswell-style document" in an attempt to smoke out additional witnesses. Moore had said that he had taken the investigation as far as he could. By this time it was clear to many that the Barney Barnett (who died in 1969 long before he was interviewed) connection to Roswell was weak at best. Barnett, who told his tale of seeing a crashed UFO on the Plains of San Agustin, did not have a date associated with it. Barnett was important to the earliest Roswell investigations because he mentioned seeing alien bodies and that was the only mention of bodies. That made it clear the event was extraterrestrial in nature. The connection was drawn by J. F. "Fleck" Danley who had been Barnett’s boss in 1947, and Danley said that he had heard the tale directly from Barnett. Pushed by Moore, Danley thought the date of this story might have been 1947, and based on sighting in Roswell on July 2, Moore and others assumed the crash to have happened on July 2. This sighting, by Dan Wilmot, has little relevance to the Roswell case other than Wilmot lived in Roswell and it happened on July 2, 1947. There is no reason to connect the sighting to the crash. When I talked to Danley it was clear that he had no real idea of when Barnett had mentioned the UFO crash. It could have been 1947, but if I pushed, I could have gotten him to come up with another date. Moore knew of the shaky nature of the Danley date. To make it worse, I learned, in the 1990s, from Alice Knight, that Ruth Barnett had kept a diary for 1947. It is clear from that document that the crash could not have taken place on July 2, if Barnett was there. In fact, there is nothing in the diary to suggest he had seen anything extraordinary or had been involved in anything that would have been upsetting. In other words, the only document about Barney Barnett that we could find suggested that if he had seen a UFO crash, it didn’t happen in 1947. Of course, in the early 1980s, Moore wouldn’t have known about the diary, but he did know how he had gotten Danley to give him the 1947 date. He would have known that it wasn’t true and that the Barnett story had nothing to do with the Roswell UFO crash. This is important because it explains why there was no mention of the Plains crash in the Eisenhower Briefing Document. Moore knew that those on the inside would know that the Barnett story did not fit into the scenario. Moore left it out because it would expose the MJ-12 hoax for what it was to those who knew the truth. And now we come to the other crash mentioned in the EBD. This is the Del Rio crash that was dated in the EBD as 1950. This is the story being told by Robert B. Willingham, who it was claimed, was a retired Air Force colonel who had seen the crash. Because he was a retired colonel, his story had credibility with those in the UFO community. I believed it for that very reason. A retired Air Force colonel would not be making up something like this. W. Todd Zechel, a UFO researcher of limited ability, in pawing through the National Investigation Committee on Aerial Phenomena files, found a newspaper clipping about Willingham and his alleged UFO crash. Back in the mid-1970s, when Zechel found the clipping, no one was taking much notice of such stories. They were considered, at best, to be mistakes and at worst, to be hoaxes. But Zechel believed the tale, and tracked down Willingham. At Zechel’s insistence, Willingham signed an affidavit about the crash, proving to many that this was a solid case. Even the Center for UFO Studies included the Willingham story on the LP (vinyl) record they produced of interesting UFO sightings. Moore knew of this story because Zechel had told him. In Moore’s book, The Roswell Incident, he devotes a brief mention to the case which establishes the link between Zechel, Willingham and Moore. More to the point, Moore believed the story for the same reason that the rest of us did. Willingham was a retired colonel. The thinking is easy to follow. Del Rio is a real crash, but Moore didn’t have all the details. Those belonged to Zechel and what he had learned from Willingham. But Moore believed this to be real and if those on the inside were going to believe MJ-12, he had to mention this crash. Without the details, he simply added a single paragraph to the EBD that suggested the craft had been nearly incinerated upon impact, which, in reality, wasn’t that far from what Willingham originally said. So, the MJ-12 document, using the information developed by Zechel and supplied by Willingham, said, "On 06 December, 1950, (sic) a second object, probably of similar origin, impacted the earth at high speed in the El-Indio – Guerrero area of the Texas – Mexican boder [sic] after following a long trajectory through the atmosphere. By the time a search team arrived, what remained of the object had been almost totally (sic) incinerated. Such material as could be recovered was transported to the A.E.C. facility at Sandia, New Mexico, for study." The situation, then, in the early 1980s was that Roswell was a real crash, the Plains might be but the date was wrong, Aztec was a hoax, as proven in repeated investigations, and Del Rio was real because there was an Air Force officer who said so. Which, of course, explains why both the Plains and Aztec were left out and Del Rio was included. I learned, as I was working on Crash – When UFOs Fall from the Sky, that no one had checked on Willingham’s credentials. I became suspicious when the date of the crash shifted from 1950 to 1955. I asked, but no one had ever looked into Willingham’s background. Apparently everyone thought someone else had done it, most believing that Zechel had conducted that research. The whole case hinged on the credibility of Willingham. But Willingham had not been an officer, had not been in the Air Force, had not been a fighter pilot and had not been in a position to see a UFO crash. In fact, though I didn’t find the newspaper clipping, I did find a one paragraph report in the February/March 1968 issue of Skylook that gave the crash date as 1948, and suggested that there had been three objects. Nearly everything about that original case had changed, some times more than once. It was clear that Willingham had invented his Air Force career, was not a retired colonel, and had served just 13 or 14 months from December 1945 to January 1948 as a low-ranking enlisted soldier. If Willingham, as the sole witness to the crash had invented the tale, then there was no Del Rio crash and the MJ-12 documents, or rather the EBD, was a fake. But in the early 1980s, Moore didn’t know this, most of the UFO community didn’t know this, and Willingham was still talking about the 1950 date. Yes, I know what the answer to this will be. What relevance does Willingham have to MJ-12? Two separate issues. Except, they aren’t. There is no other witness, document, indication, suggestion, or mention of the Del Rio case without Willingham. If not for his discussion about the case in 1968, if not for Zechel’s interview of him in the 1970s, there would be no mention of a Del Rio UFO crash anywhere. That it is mentioned in the MJ-12 EBD, and we can draw a line from Willingham to Zechel to Moore, that suggests all we need to know about this. 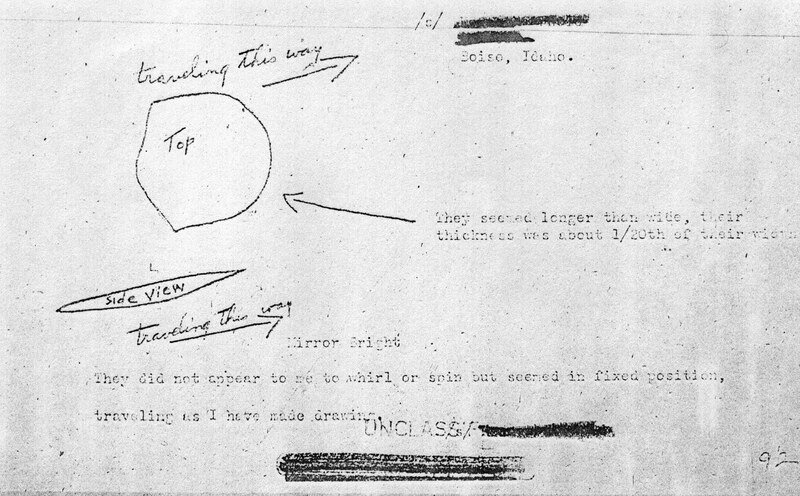 There was no Del Rio UFO crash and if there was none, then it shouldn’t have been mentioned in the Eisenhower Briefing Document. If we look at the state of UFO research today, we realize that much of what was said in the EBD about Roswell was not quite right and the information about Del Rio completely wrong. The more we learn about the events in Roswell, and the more we learn about the lack of detail for Del Rio, the better the case against MJ-12 becomes. Couple the other problems to this, the lack of provenance, the typographical errors, the incorrect dating format, and the anachronistic information, then the only conclusion possible is that there is no MJ-12. There never was, except for a 1980 unpublished novel written by the late Bob Pratt with the assistance of Bill Moore and Richard Doty. The only question left is how long are we going to have to listen to the nonsense that is MJ-12. I have learned that Richard Hoagland, he of the face on Mars fame, has another startling revelation for us. He is going to announce that one of the moons of Mars is artificial and hollow. This would be, of course, absolute evidence that there is intelligent life beyond Earth. I would be truly excited about this if this revelation was new. It is not. There has been speculation that the moons of Mars, both tiny and orbiting close to the planet, were artificial. Around 1958, Russian astrophysicist Iosif Samuilovich Shklovosky, studying the secular acceleration of Phobos’ orbital motion suggested a "thin sheet metal" structure for Phobos, a suggestion which led to speculations that Phobos was of artificial origin. If the satellite is indeed spiraling inward as deduced from astronomical observation, then there is little alternative to the hypothesis that it is hollow and therefore martian made. The big 'if' lies in the astronomical observations; they may well be in error. Since they are based on several independent sets of measurements taken decades apart by different observers with different instruments, systematic errors may have influenced them. The point is simply this. The idea that Phobos is artificial is nothing new. The new spin is that Philip Corso, he of The Day After Roswell fame, is the source for this. Bill Birnes, who co-authored the book with Corso tells me that Corso made no such claims. Trying to get to the truth in an event that happened over sixty years ago is difficult at best. While I knew about the photographs taken by William A. Rhodes, had read the newspaper articles about them, and had read the Project Blue Book file about them, I had never delved too deeply into them. I just knew that the Air Force explanation of hoax was not based on any evidence that I had seen. Rhodes, based on all this, seemed to be an eccentric guy who had a backyard workshop that he thought of as the Panorama Research Laboratory. He had letterhead paper and thought of himself as the Chief of Staff at the lab. He was not the first person to open a small enterprise and give it all a grandiose name. He certainly wouldn’t be the last. The Air Force dismissed him as a fellow who lived off his wife’s income as a teacher and whatever he could make as a musician. They challenged his claim of a Ph.D. in a not very clever way, and suggested he was a crackpot not worthy of further discussion. His pictures were faked. I regret that I never tried to find Rhodes and talk to him about his pictures. It wouldn’t have been all that difficult in the pre-Internet days. I mean, I found Delbert C. Newhouse who took movie footage of UFOs over Trementon, Utah. I intereviewd Carl Hart, Jr., in the mid-1990s about the pictures he took of the Lubbock Lights. I found Dewey Fournet and Al Chop who were involved with the official UFO investigations, the Washington National UFO sightings, and even sent Chop a copy of UFO, the movie about his experiences. But I never thought to find Rhodes. So now I have to do everything with Rhodes gone. Rhodes is considered to be a genius by many who knew him. James McDonald, who investigated Rhodes in the 1960s made it clear that Rhodes was an inventor who held a number of patents, some of which provided a "modest" income. I don’t know how much money that might have been. Surely not more than a couple of hundred dollars a month, but enough to have helped. His claim of a Ph.D., issued by the government is a little more difficult to prove. I have no doubt that during World War Two he was given some sort of test and scored high enough to be assigned work at a doctorate level. We still have that sort of thing in the world of the UFO. People who have not had the schooling, but who had worked at these high levels. Sort of a "bevet" degree, if you will. Clearly Rhodes did not have a recognized advanced degree, and if this is enough of an embellishment for anyone to reject his photographs as faked, so be it. I think that Rhodes was honestly reporting what he had been told by a government official during his work for the Navy. He embraced it with an enthusiasm that is similar to that of others in similar circumstances. It’s not as if he invented the degree himself. But it’s not as if what he was told had any real merit in the world beyond that Navy job he held during the war. Those who knew him tell me that he was very smart. One of those I contacted told me, "I remember Bill as a self-made genius. He even made the first image tubes that were sensitive enough to use at a telescope. But he seemed to lose interest in any of his detector advances as soon as he was satisfied that they would work. Unfortunately he had a knack of offending key persons at ASU [Arizona State University] and no doors opened for him. His portable 16-inch telescope was useful to me years later when I needed a network of independent amateur telescopes to monitor stellar "twinkling" as an indicator of the blurring ground objects as would be seen from a space optical system." This seems to suggest he might have had an "abasive" personality. Note that it says here that he "had a knack of offending key persons at ASU and no doors opened for him." Doesn’t mean he wasn’t smart, just that he had no "people skills." In my email to one of these supporters, he mentioned the "Phoenix Photographs" and offered an explanation for them. The object was some kind of classified balloon-borne camera that was being used to determine how crisp and clear pictures taken from high in the atmosphere could be. It seemed like a reasonable explanation and I asked for some additional details. But, before I got those, I had some time to think and realized that the explanation made no sense because it had not been offered in the more than sixty years since the pictures were taken. To make it worse, the response suggested the object had been over the city for two days. Not to mention that even if this was a classified project, as alleged, the answer would have been available to both the Air Force and the FBI and there is no indication in the files of this ever having been suggested. Remember, the Blue Book files (or in this case the Sign and Grudge files) were originally classified as "secret" so there would have been no trouble learning of the explanation, if such was the case. Yes, you’re thinking "Need to Know." But in this case, they had a need to know. Even if the explanation was only offered quietly, those conducting the investigations had a need to know, and such an explanation would have been obvious in the files. Oh, they might not have mentioned the name of the project, but they certainly could have suggested the explanation was a classified project. I was given the acronym of the organization that would have been in charge of this research, but according to everything I could find, it wasn’t created until the Eisenhower Administration. That would have made it six years too late, at best but this avenue deserves further investigation. And there was even more trouble. According to a letter written by Rhodes and addressed to Colonel Howard McCoy, Chief of Intelligence (at ATIC at Wright-Patterson AFB), he said that he had been "trying to run down additional photographs of the unidentified object." There is no evidence in the files, or anywhere else that I can find of a follow up to this rather startling information. Rhodes was invited to Wright-Patterson a year or so after he took the pictures. This was for another interview, but the government, or more specifically, Howard McCoy, wrote they could provide transportation but could cover no other costs. Rhodes declined. So, now, though I had thought this would end quickly, there are more avenues to explore. I have found two documents, one running to over 350 pages, that deal with part of this story. No, not about the UFO sighting or photographs, but to the classified experiments that were being conducting and which might, and I stress the might, explain the pictures. As far as I know, no one has ever found the alleged Larmore pictures, the Air Force did not follow up on Rhodes’ letter telling them about the pictures, they did not attempt to find and interview Larmore, and the pictures did not surface in any magazine or newspaper. It seems to me that had an explanation been available, even if classified in 1947, it would have been noted in the file somewhere. Many of the documents in the file were originally classified so the mention of a classified project as a solution wouldn’t have been in violation of the regulations. The Rhodes photographs, it seems, were ignored by the Air Force, the Air Force explanations don’t work, and it is clear they engaged in subtle character assassination of Rhodes. I believe, at the moment, that the follow up investigations were made, but not by the people at Project Sign (meaning Project Blue Book). Somewhere there is a file on this. The trick for me is to figure out where to send the FOIA request and what to ask for when I sent it. 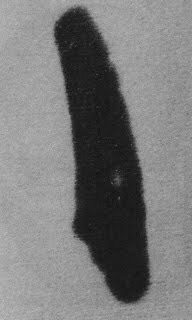 I said that I would look for more information on William A. Rhodes (seen here in a bad photograph, but one taken in 1947) and I have uncovered a few additi on facts. Seems he wasn’t quite the dummy that the Air Force would have us believe. The Air Force reported that Rhodes was a self-employed musician and the only source of income was his wife’s salary as a fourth grade teacher. In a report written by Lynn C. Aldrich, (on a form labeled with United States Air Force and dated 17 August 1949), Rhodes is described by a Mr. and Mrs. (name redacted) as "emotionally high strung, egotistical and a genius in fundamentals of radio and electronics. In another interview conducted on July 15, 1949 of another witness whose name is also redacted, she described Rhodes as "emotionally high strung and egotistical." In a report dated July 14, 1952, by Gilbert R. Levy, Rhodes is again described as "an excellent neighbor, who caused no trouble, but judged him to be emotionally high strung, egotistical, and a genius in fundamentals of radio. He conducts no business through his ‘Laboratory,’ but reportedly devotes all his time to research." They also report that he is listed in the telephone book as "Dr." but they could find no reference to Rhodes in the classified section of the telephone directory "under Physicians & Surgeons (MD), Dentists and Veterinarians." Which, of course, would be of great importance if these sorts of people were the only ones entitled to be addressed as "Doctor." They do suggest his claim of a Ph.D from Columbia University could not be verified, and checks by others including James McDonald, bore this out. We have seen, however, why Rhodes believed that he had been granted the degree and he did have a small replica of the diploma encased in plastic. He said that he had a larger one somewhere but never did produce it. The Air Force also seemed annoyed that Rhodes claimed he owned or worked for Panoramic Research Laboratory. They could find no evidence that it had ever been incorporated or that it ever con ducted any business. In the AMC summary evaluations, as part of the Project Grudge Report, Appendix 1, they go further in their character assassination of Rhodes. They noted, "In subsequent correspondence to the reporter of this incident, the observer [Rhodes] refers to himself as Chief of Staff of Panoramic Research Laboratory, the letterhead of which lists photography among one of its specialties. Yet, the negative was carelessly cut and faultily developed." They also note, "there are other undesirable aspects to this case. The observer’s character and business affiliations are presently under investigation, the results of which are not yet known." The same report continued, "Dr. Irving Langmuir studied subject photographs, and after learning of the prior passage of a thunderstorm, discounted the photographed object as being merely paper swept up by the wind." And then, as if to reinforce this character assassination, the report said, "AMC Opinion: In view of the apparent character of the witness, the conclusion by Dr. Langmuir seems entirely probably (sic)." Of course, not mentioned is the complete discounting of the verbal report by Rhodes. He heard a whooshing sound which drew his attention to the craft which, of course, rules out paper blown by the wind. And you must discount the size, speed and altitude estimates provided by Rhodes, though most people, looking up at an object in the sky fail to correctly estimate much about it. But here there were clouds in the sky which gave, to some extent, a point of reference. And, in the second picture, there is some foreground detail. In other words, the Air Force seemed to go out of its way to discredit Rhodes, suggesting that he was an egotistical man who lived off the income of his wife. Although the neighbors had said he was a good neighbor, the Air Force reported that he hated cats and dogs and has shot several animals that strayed onto his property. I’m not sure that I would describe someone who shot pets as a good neighbor, so you have to wonder about these claims by the Air Force. And here’s the flip side of this. Rhodes said that he had done experimental work with the Naval Ordnance Laboratory in Washington, D.C. during World War II. He returned to Phoenix in 1942 and worked as an instructor at Falcon field. Tony Bragalia and I both found that Rhodes did hold multiple patents which suggested he wasn’t quite the "weirdo" that the Air Force made him out to be. He seemed to be the genius that his neighbors believed him to be. And with patents often come licensing fees, which would be a source of income not readily seen by those who didn’t know about it. I saw nothing in the Air Force investigation that suggested they had looked at his tax returns to learn if his lab brought in any income. Dr. James McDonald investigated Rhodes in the 1960s and found that he held a variety of patents, and according to a letter dated February 18, 1967, wrote, "...who has made a modest living off an impressive variety of inventions." McDonald, then, did what the Air Force couldn’t, or didn’t, that is, verify Rhodes’ creative genius. It is quite clear from the files that the Air Force thought little of Rhodes and his "eccentric life style." They made fun of his lab and his research, suggesting he was an unemployed musician and mentioning little about his technical background. Clearly he was a clever man who invented or modified a number of things and was granted patents on them. I have found nothing in the case file, nor in the investigations to reject the photographs or to suggest they were a hoax. Instead, I noticed that the Air Force drew a line connecting the Rhodes photographs with the first of the Kenneth Arnold drawings. I think that was a connection they would rather not be made in the civilian world because it suggested that Rhodes tended to corroborate Arnold and they would be happier if the sightings were not connected. But the real problem here, knowing now what I know, is that the Air Force was attempting to belittle the value of the photographs by careful character assassination. Rhodes was a clever man, doing work at a Ph. D. level for the government during the war, but when his name surfaced with UFO photographs, he became a crackpot who inflated his ego with his Panorama Research Laboratory and claiming a degree he had not earned. In the end, there is no valid reason to reject the photographs. At least there was none I could find in the files. If that is true, then the pictures become more important... as does the Arnold sighting. Not long ago I got a strange telephone call from a fellow who claimed that he had known William A. Rhodes, the guy who took two UFO pictures on July 7, 1947. He said that he had known Rhodes well and that his expertise extended way beyond his brush with the world of UFOs. Now I confess that my interest in Rhodes extended to the pictures he took, and the way the object seemed to mirror that being seen around the country at that time, and little else. No, it wasn’t a flying saucer because it wasn’t saucer shaped. 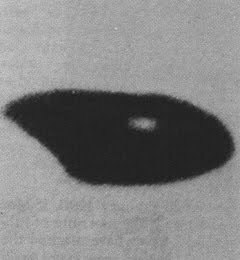 It was more of a heel shape that was what Kenneth Arnold had reported when the term "flying saucer" was invented (Arnold drawing on top, Rhodes photograph on bottom). People talked of flying saucers, but the name covered all sorts of objects from circular to cigar shaped to ball shaped and most of anything else. Rhodes, who claimed to have a Ph.D, but who was unable to produce any document supporting that claim, might not have been the lunatic that some thought. According to what the caller told me, Rhode s held a number of patents and had been working on a "gravity shield." He said that Rhodes had gone to work for the War Department during World War II, and that had been working on something that either prevented the magnetic mines from detonating or a way of detecting enemy submarines by a means other than sonar. I knew that the Air Force had written off Rhodes’ photographs as a hoax but the motivation there might have had nothing to do with Rhodes, and more with what the photographs looked like. They seemed to provide a corroboration of the Arnold sighting. Given some of the descriptions of the craft that crashed at Roswell, the photographs might have also shown an object similar to what had fallen there. At any rate, the Air Force was not impressed with either Rhodes or his background. Additionally, after being thoroughly investigated by the FBI, I was issued top-secret status. Not even my wife was to know. The creation was a method of neutralizing the earth's magnetic field in ships. Not a single ship or sailor was lost to magnetic mines during the war's remainder. One day, my boss summoned me to his office and explained: "We have a total absence of degree'd doctorates, and having already passed requirements, you have been selected to receive a Ph.D in Physics. The degree would be known by the nickname "90 Day Wonder", and my work would not be disrupted to gain it. The way this was explained to me was that Rhodes had taken some sort of test for the position he held. Depending on how well you had done, you were assigned work. Some were given work that would have been assigned to those who had the "equivalent" of a MS and some a Ph.D. Rhodes scored high enough for the Ph. D.
Working 16 hours daily, seven days a week, my health began failing. The degaussing system was in full production. My resignation was accepted by Commander Bennett from whom I received a letter of regret, and wished me the best. Back home in Phoenix found the same old agrarian system. Ph.D's could only find work picking oranges of vegies, so I began searching for clients nationally. Soon they found me without advertising. Forward to 1955. From the U of Michigan came Dr. Aden Baker Minel chosen by the National Science Foundation to locate what is presently Kitt Peak Observatory. I applied and was hired immediately for development of instruments relating to the observatory's location. He inquired about my education. When I said 90 day wonder, he grinned and said "Me too", and continued, "Why are you not using it." Replying I didn't think it had any value. "It has the same value as one issued by any university. Use it like I have, your research business needs it." After Kitt peak was selected, Dr. Minel moved to the University of Arizona where he developed what is now know as the Hubble Space Telescope. A few years later he died from heart failure. I owe him a debt of gratitude for his insisting my degree should be used. He also said that his background had been investigated by the FBI for a security clearance so he could do his classified work. It would seem to me that if this is true, then those investigating his UFO photographs should have known that, especially since the file suggests the FBI was involved. And if they were, then the smear campaign that took place about Rhodes’ background and education was just that, a smear campaign. Even if the Air Force didn’t know, and no one told them, someone at the top knew and didn’t mention it. Right now, I don’t know how accurate this information is. I have been told that Rhodes held a number of patents and I have seen, again, on the Internet, several patents issued to William A. Rhodes. They were assigned to a guy living in Phoenix, which is where Rhodes lived, and I suspect it is the same guy, but I just don’t know for certain. If the information is accurate, and this is the same William A. Rhodes, then he got a short shift from the governmental UFO investigators. The questions about his degree become somewhat irrelevant simply because the government was the entity that suggested he had the "equivalent" of a Ph. D and treated his work accordingly. Then, later, because they didn’t happen to like what he had photographed, they asked the questions about it, suggesting he was less than honest and therefore his photographs could be questioned. Talk about double dealing. This is something that I’ll pursue, seeing what I can learn about Rhodes. It seems he might be something of a radical, in the mold of Nikola Tesla, but who didn’t get the same publicity as Tesla. But that doesn’t say anything about the pictures. I can see no reason for Rhodes to have faked them, it gained him nothing, and given the information released by the government, made him look rather unreliable. This really is something that deserves more work.